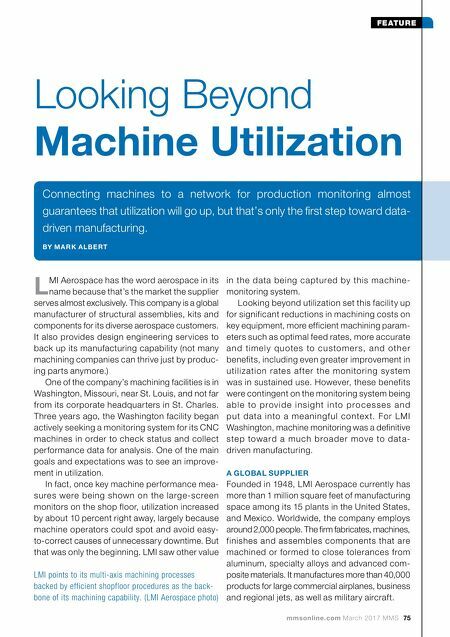 mmsonline.com March 2017 MMS 75 FEATURE L MI Aerospace has the word aerospace in its name because that's the market the supplier serves almost exclusively. This company is a global manufacturer of structural assemblies, kits and components for its diverse aerospace customers. It also provides design engineering services to back up its manufacturing capability (not many machining companies can thrive just by produc- ing parts anymore.) One of the company's machining facilities is in Washington, Missouri, near St. Louis, and not far from its corporate headquarters in St. Charles. Three years ago, the Washington facility began actively seeking a monitoring system for its CNC machines in order to check status and collect performance data for analysis. One of the main goals and expectations was to see an improve- ment in utilization. In fact, once key machine performance mea- sures were being shown on the large-screen monitors on the shop floor, utilization increased by about 10 percent right away, largely because machine operators could spot and avoid easy- to-correct causes of unnecessary downtime. But that was only the beginning. LMI saw other value Looking Beyond Machine Utilization Connecting machines to a network for production monitoring almost guarantees that utilization will go up, but that's only the first step toward data- driven manufacturing. 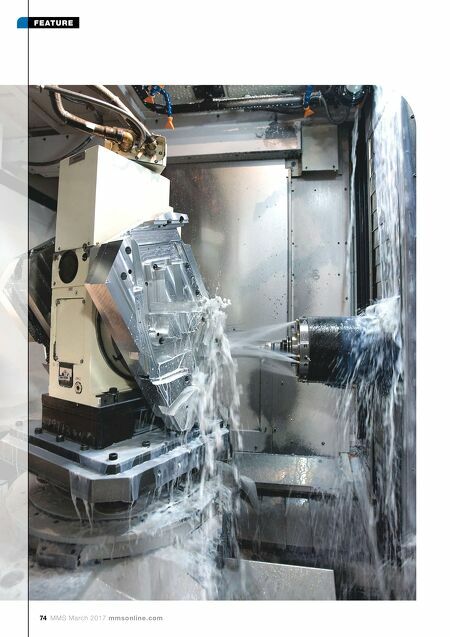 BY M A R K A LB E RT LMI points to its multi-axis machining processes backed by efficient shopfloor procedures as the back- bone of its machining capability. (LMI Aerospace photo) in the data being captured by this machine- monitoring system. Looking beyond utilization set this facility up for significant reductions in machining costs on key equipment, more efficient machining param- eters such as optimal feed rates, more accurate a n d ti m e l y q u ote s to c u s to m e r s, a n d oth e r benefits, including even greater improvement in utilization rate s af te r the monitor ing syste m was in sustained use. However, these benefits were contingent on the monitoring system being a b l e to p rov i d e i n s i g h t i n to p ro c e s s e s a n d put data into a me aningf ul contex t. For LMI Washington, machine monitoring was a definitive ste p towa rd a mu c h b road e r m ove to d ata- driven manufacturing. A GLOBAL SUPPLIER Founded in 1948, LMI Aerospace currently has more than 1 million square feet of manufacturing space among its 15 plants in the United States, and Mexico. Worldwide, the company employs around 2,000 people. The firm fabricates, machines, finishes and assembles components that are machined or formed to close tolerances from aluminum, specialty alloys and advanced com- posite materials. It manufactures more than 40,000 products for large commercial airplanes, business and regional jets, as well as military aircraft.